Villa Kadife Iki is a contemporary, luxury air-conditioned villa set in a quiet location above the village of Kalkan. 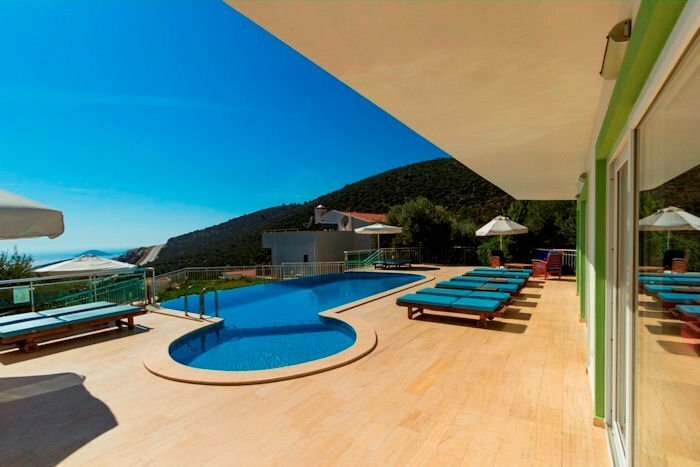 Villa Kadife Iki is a contemporary, luxury air-conditioned villa set in a quiet location above the village of Kalkan. The villa has stunning views of Kalkan bay and is close enough to walk downhill into the Kalkan village. The interior is modern, spacious and cool and has been equipped to meet your every need. Outside is has its own private infinity swimming pool with extensive terrace and garden areas, for those sun downers and a stone built BBQ for alfresco dining. There are luxury double sun loungers for all guests with parasols. The premier resort of Kalkan with its excellent cuisine, array of shops, bars and restaurants, are a 15 minutes stroll away, or 3 minutes taxi ride. The perfect place for a relaxing upmarket holiday villa rental in Kalkan. Villa Kadife Iki with 6 bedrooms villa with large pool and pool area with sea view. There is large garden with flowers and BBQ. Also there are 12 sun beds and outdoor table for dinner by poolside. There is closed garage and alarm system. Bedroom 1 is en-suite double bedroom with sea and nature view has double bed, nightstand, dressing table, wardrobe, air conditioning and bathroom with shower. Bedroom 2 is en-suite double bedroom with sea and nature view has double bed, nightstand, dressing table, wardrobe, air conditioning and bathroom with shower. * Bedroom 3 is en-suite twin bedroom with sea and nature view has twin bed, nightstand, dressing table, wardrobe, air conditioning and bathroom with shower. Bedroom 4 is en-suite double bedroom with sea and nature view has double bed, nightstand, dressing table, wardrobe, air conditioning and bathroom with shower. Bedroom 5 is en-suite twin bedroom with sea and nature view has twin bed, nightstand, dressing table, wardrobe, air conditioning and bathroom with shower. * Bedroom 6 is en-suite double bedroom with sea and nature view has double bed, nightstand, dressing table, wardrobe, air conditioning and bathroom with shower. Kalkan has a small but pleasant beach only a few minutes walk from Villa Kadife Iki. Or, on the Western side of Kalkan, is Kalamar beach, which has a beach club and a couple of waterside restaurants to choose from.